Once again the 6 x 4 lives challenge due date is starting to register on my consciousness. So I commenced this months card which is more a design exercise than anything else. The background is hand dyed and painted linen and I have stitched on some hand dyed flannelette cotton and some sequin waste. At the moment it is not looking too great but after couching some heavy threads into place I have started to work French knots and some detached chain stitches in wool, cotton, rayon, and silk threads. I am sure everyone can see that the design element I am exploring in this little abstract piece is a sense of space. Browsing the sites of those that have the fabric postcard bug I discovered that Mimi Kirchner has created some totally charming fabric postcards. Take a look at her blog Doll as they are a total delight with a real sense of innocent narrative about them. Mimi has not said she is in the 6 x 4 challenge but I was so taken with these that I just have to point to her work. Also have a look at Susan’s work on Smockery as she has extended the paisley theme in her piece in a very interesting manner. Compositionally this is an interesting panel and a good example of how working a postcard format as an experiment can lead to greater things. As part of her Motif a day series Katie published a line drawing of a landscape which can be used as a fabric postcard. Emmy of Cramzy has used the 6×4 challenge to work a needle felted fibre card. cowgirl53 has printed a photograph on to fabric and incorporated that into a postcard. Ampy too has joined the challenge with a monochromatic card. Maureen of Tangled threads has posted some of her fabric postcards which she is going to auction for charity. Kim of Skybellarts has posted an image of the fabric postcard she made. The motif derives from celtic mythology. Kims Flickr site is here . There is some great stuff on it so do check it out. As I am sure many people are aware of Maureen (yep another Maureen) of Kenmaurscorner is running a series featuring a fabric postcard a day. Maureen has been highlighting some interesting cards so do not miss the series. I just found out about fabric postcards- am intrigued! Do you really mail them? they would make a neat gift! I think I will start…. Very Elegant design, my hats off. I look forward to seeing where this goes Sharon. 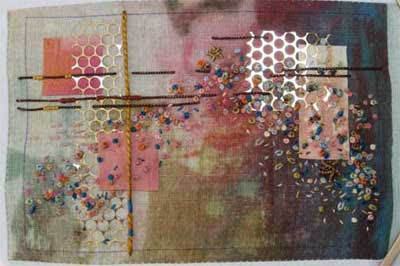 I am really enjoying this kind of embroidery currently, and to see how you work thru a piece will be useful. Thanks for showing a work in progress, Sharon…very interesting…See, that wasn’t so hard!